Remember how your mother would always tell you to watch what you say because you never know who’s listening? Well, this is one piece of advice you don’t want to ignore—and that’s universal across age, gender, educational status and occupation. 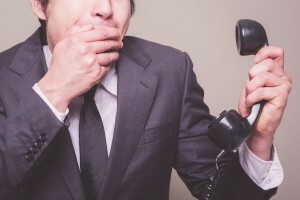 My “mouth” has gotten me into trouble a day or two in my life, but saying the wrong thing at the wrong time can be especially harmful when it comes to your career. I recently witnessed this firsthand, and let me assure you, the consequences were not pretty. A man, Caucasian, is sitting at a table in the library. He’s flipping through a newspaper and chatting rather loudly with the gentleman seated across from him. “What?” the man seated across from his asks. Although I won’t include his exact statement, the Caucasian man then explains how he is reading a story about Alabama—a state with a majority population of “black folks”—and he proceeds to use racial slurs when referring to black people, the typical deep south and the stereotypical events of the news story. You see, the library’s internet was down that day, and the Caucasian man had previously announced that he was there for an interview. He had arrived early to surf the web while waiting, but because of the current technological issues, he sat down to read the paper instead. After spewing a few racial slurs, the man across from him just shrugged off his comments, choosing not to respond. But, do you remember how earlier I noted that this man was talking very loudly? Well, a lot of other people “overheard” his comments—one being the African American man looking through periodicals nearby. He approached the Caucasian man. “Is your name John Doe?” (obviously a name change). The Caucasian man looked confused while nodding yes. Well, as luck (or in this case bad luck) would have it, the African American man had also arrived at the library early—to conduct an interview. And can you guess the person he was supposed to be interviewing? That’s right, our beloved, racial-slur-spewing-loud-talking John Doe. Now if you think the interviewer decided to take the “high road” and still interview our John Doe, you’d better think again. But by the look on John Doe’s face after he realized who this man was, I honestly don’t think he would even want to go through with the interview anymore. John Does’ mouth had already counted him out. Well, although I didn’t speak with any of these gentlemen, I will assume that it wasn’t so much that John Doe was spouting racial slurs and that the interviewer was a black man. I believe the issue goes a bit deeper. You see, John Doe’s words are a reflection of his viewpoint, which most often come from an individual’s morals and ideologies. Any organization is going to want employees whose personal views (we’re talking prejudices in this context) are in line with that organization’s. So, unless John Doe was applying to work with the Klu Klux Klan, I don’t believe most employers are going to want to bring on someone who displays a sense of prejudice—at least not publicly. Employees are a reflection of their employers, and this holds true even when they’re off the clock. We all have biases, and I’m certain all organizations are filled with people who have personal ideologies and morals that may be contrary to what their employer may deem acceptable or right, but I’m also certain these people landed and retain their jobs because they understand the importance of where and how to express those views. An employer isn’t going to hire someone who bashes homosexuals during an interview, nor would it give an applicant a callback after seeing any kind of racial slurs on his or her social media accounts. Whether or not you believe John Doe’s viewpoints are right or wrong isn’t the point; the issue is that there is an acceptable time and place for everything, and unfortunately, when you’re on the job search (or even as an employee) and working to brand yourself, freedom of expression isn’t always the best route. Because if you’re careless with your words and the “right” person is around—e.g. a hiring manager—this freedom could cost you a potential job. So, while you’re monitoring your online reputation and tightening up your resume, don’t forget to choose your words carefully. And if you catch yourself forgetting this advice, remember something else you heard during your child hood: Mom always knows what’s best.